Many things in life have a cyclical cadence to them. In nature, you will find that water has a cycle, a dominate nitrogen cycle, and even a carbon cycle. Economies unquestionably have a cyclical nature to them as well, fluctuating between periods of expansions and contraction. The business cycle is comprised of mechanisms such as interest rates, employment levels, and consumer confidence. Cycles have also been detected in areas such as agriculture, astronomy, the climate, social trends, and even in war. Finding your bearings in the various cycles for stocks, real estate, commodities, and macroeconomics is critical to investing. This article will briefly describe the cycles and timing factors that influence the precious metal markets, including silver (my favorite), platinum and palladium. A gold trader that doesn’t follow the gold cycles is akin to a carpenter that doesn’t use a level. 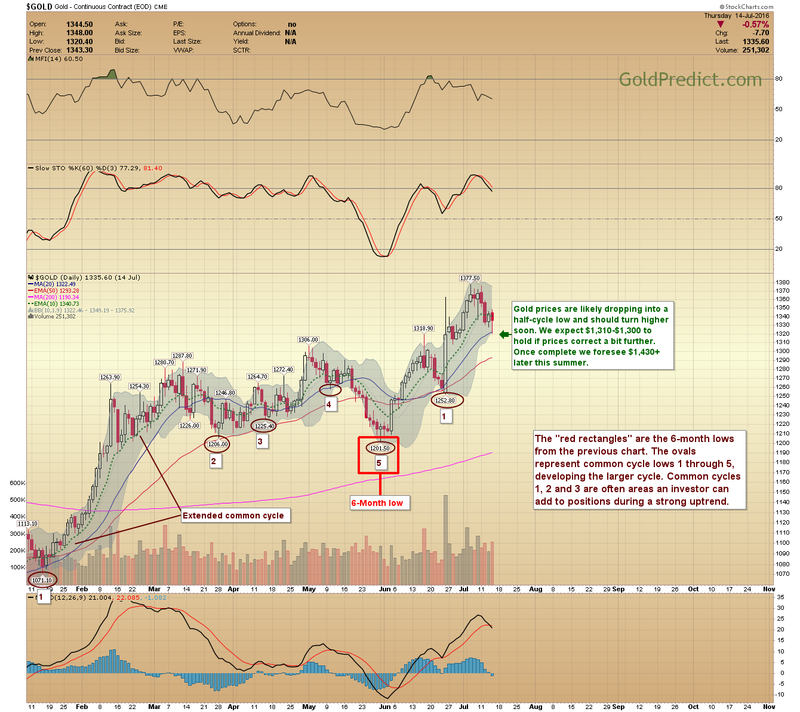 We believe there are three important cycles in the gold sector. They are the 8-year cycle, the 6-month cycle, and the common cycle. The shorter cycles make up the subsequent larger cycle. For example, approximately 4 to 5 common cycles form the 6-month cycle. Whereas roughly sixteen 6-month cycles make up the 8-year cycle. All precious metal sectors are affected by these cycles; we primarily focus on gold because it has the most liquidity. Smaller and illiquid markets are choppy and hard to gauge. 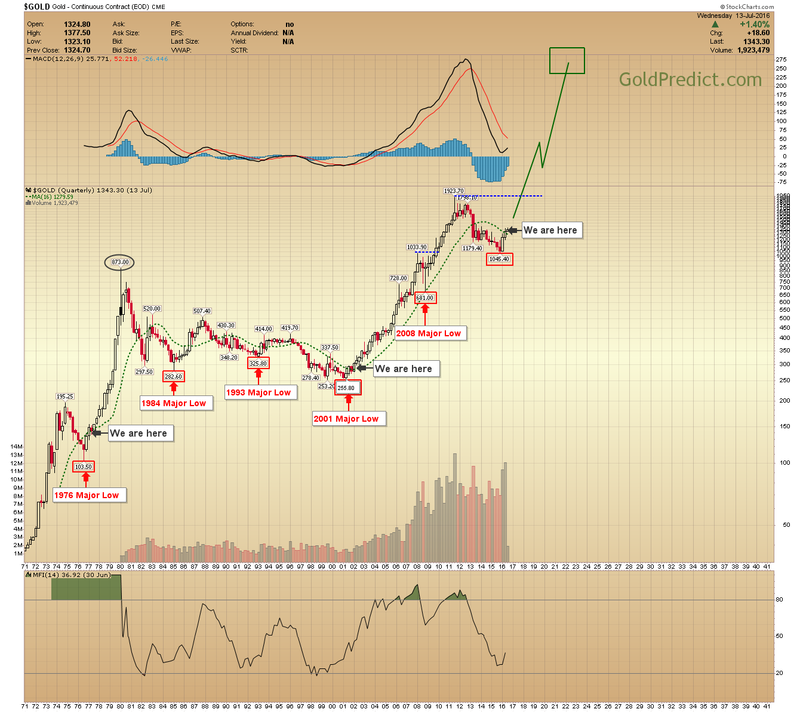 Anyone that follows my work understands the importance of the 8-year gold cycle. This cycle averages around 30-Quarters between lows and represents the best of buying opportunities. During the 80’s and 90’s the 8-year cycles produced modest returns as the economy experienced a significant expansion phase. Thanks to the advent of the personal computer and internet. Gold underperforms during extreme economic advancements such as that. Note the “We are here” markers representing the moment in time before historic price moves. The preferred cycle for intermediate-term investing. To simplify things, we labeled this the 6-month cycle, despite observing cycles lasting just four months or less. Nevertheless, there is a rhythmic nature to it. Specific economic events, and sentiment can either extend or shorten this period. 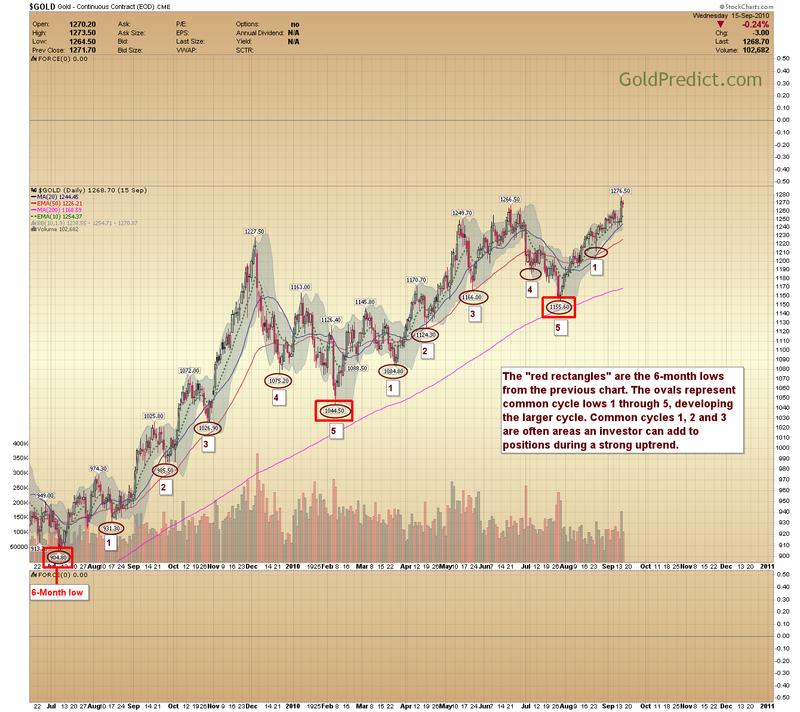 Below is a weekly chart of gold from 2009-2012. We cherry picked this timeframe because it was an excellent illustration of successive cycles during a healthy uptrend. Each “red rectangle” represents a 6-month cycle low and a good intermediate-term entry point. This is the most difficult cycle to recognize and varies widely. Below is a daily gold chart from the previous example. Each common cycle lasts an average of 1-month give or take a week. Individual cycles are shortened while others extend, especially during volatile conditions. Approximately five (5) common cycles make up the larger 6-moth cycle as demonstrated in the chart. The “red rectangles” are the 6-month lows from the previous chart. The ovals represent common cycle lows numbered 1 through 5; these produce the larger trend. Common cycles 1, 2 and 3 are areas an investor will add to positions during a stable uptrend. Gold prices are likely dropping into a half-cycle low or making the second common cycle low; they should turn higher soon. We expect $1,310-$1,300 to hold if prices correct a bit further. Once complete we foresee $1,430+ later this summer. The next 6-month low isn’t due until November or December of 2016. Hopefully, you found this quick lesson in fundamental cycle analysis informative. With any luck, you’ll at least acknowledge a rhythm and method to the gold price. 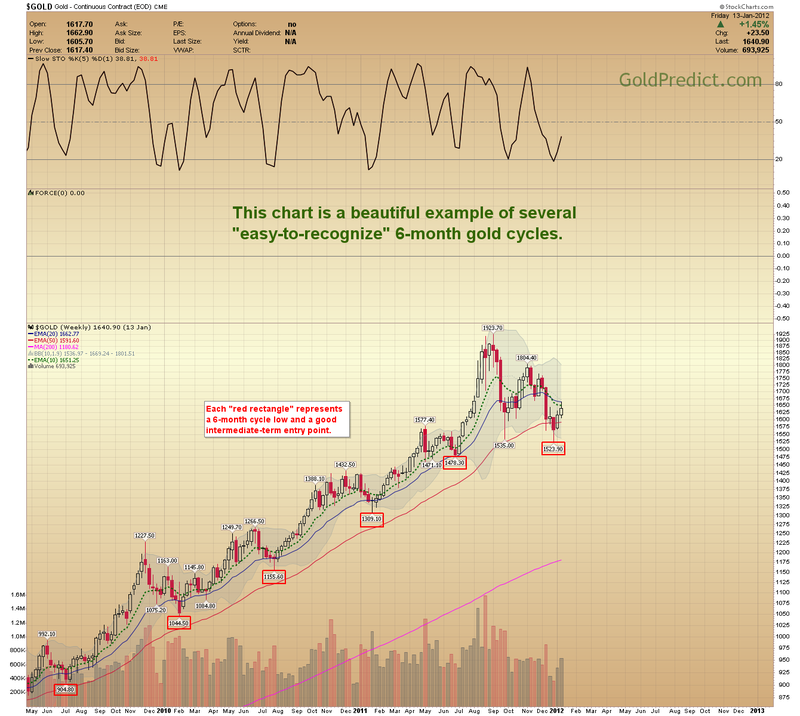 Cycle timing and technical analysis are the two pillars of precious metals forecasting. When combined they become a powerful tool that aids investors. If our analysis is correct, precious metals should continue to rise for the foreseeable future, making several cycle lows along the way. Learning to read and understand these cycles is imperative to successful investing.